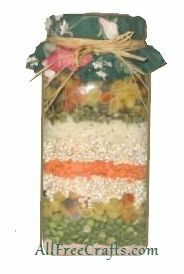 Layered soup in a jar always looks so attractive that it’s a perfect homemade gift in a jar for any time of year. This one, Beef Barley Soup, is packed with taste and healthy nutrition in mind as well. I have included a free printable jar tag for you to attach to the jar. Use a wide mouth funnel to add all the ingredients to a one quart jar, layering in the order given above. Make sure the jar is tightly packed to prevent contents from moving around. Cut a circle of fabric to decorate the jar lid, fasten with a rubber band. Cover the rubber band with raffia or ribbon, attaching the printed gift tag, which includes the cooking instructions, at the same time. Print and cut out the gift tag. Fold in half then in half again, so the illustration is on the front and the directions are on the inside. Fill in the “To” and “From” page and attach to your gift in a jar. Add one pound of stewing beef, cut into 1/2 inch pieces, to six cups of water in a large pot. Bring to a boil and simmer for 30 minutes. Remove pasta from top of jar and set aside. Add six more cups of water and remaining ingredients to the pot, bring back to a boil, then simmer for 45 minutes or until meat is almost tender. Add pasta and simmer for 15 minutes more. Enjoy. I make this layered soup for gifts, everyone LOVES it….very pretty gift. Thank you for letting me know, Mary. You made my day. It is a nice choice, and I’m glad it works so well for you.